Dealing with the laundry is one of the biggest drains on my time when it comes to housework. Even with only the two of us in the house there’s still a lot of washing to do. H gets through a lot of clothes with various school and out of school activities which require different types of clothing. Then there’s me. I try to keep it to a minimum, but as well as day to day stuff, going out clothes, there’s swimming and yoga kit to deal with too. 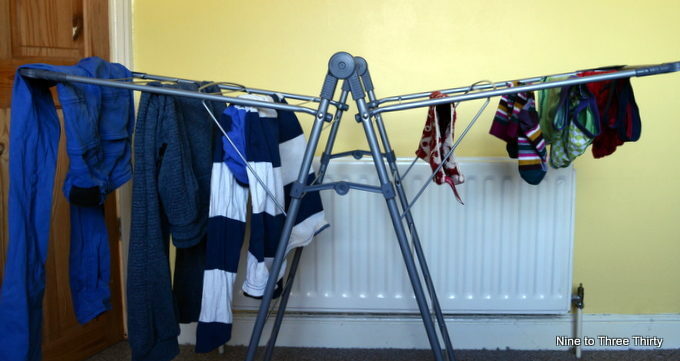 Generally I manage the washing by doing about 3 loads a week and then drying the clothes on airers. I’ve never been a tumble drier fan – I won one once in a competition, but hardly used it (and was horrified by how much electricity it used up), so I gave it away to a friend. I now dry everything on airers, although I would like a washing line again. In the summer the airer goes out on the patio or into the conservatory, but the rest of the time it sits in the spare bedroom. I’m lucky, I guess, that I have room to dry clothes like that. I find most of the year that clothes dry quite quickly indoors. In the winter it helps to be near a radiator and in summer outside or with the window open helps. I do sometimes struggle a bit in spring and autumn if I don’t have the heating on, but it isn’t really the weather for drying outside. I’ve been trying out a new airer from Addis. 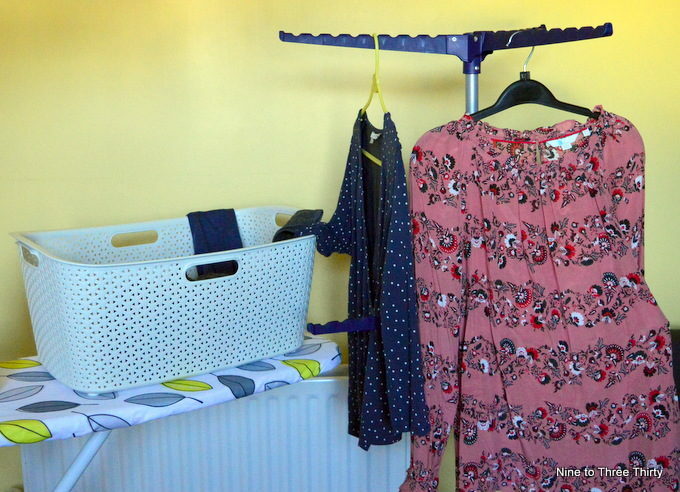 This Slimline X Wing Airer from Addis is easy to put up and can handle quite a lot of washing. I like how the washing is held out over quite a large area because I often find that clothes can dry slowly on more vertical airers. I haven’t done a scientific study, but I feel that the washing dried faster that way. As you can see it folds up very small after use. 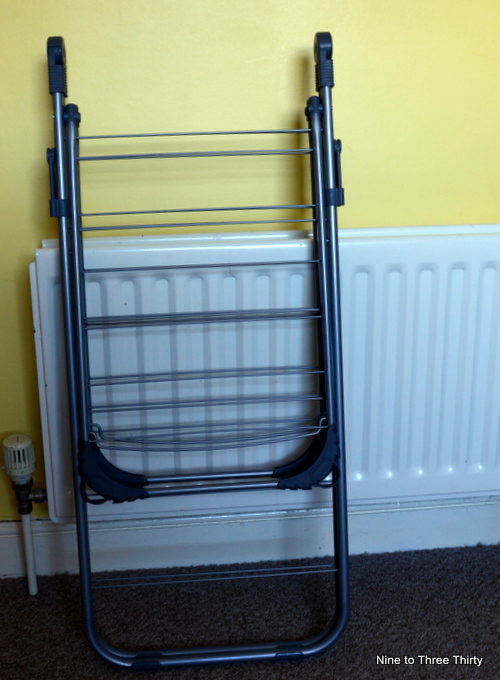 Having an airer that is easy to put up and down and that folds up small works well for me. Doing 3 loads of washing a week, I don’t have washing drying all the time, so some days I like to put away the airers and have the space back. The 10m Slimline X Wing Airer holds a reasonable amount of washing, but I’d probably need to use it alongside another airer to get a whole load of washing dry. Now we get onto the ironing. I’ve heard lots of people say that they don’t iron, but I just can’t get there. My clothes just don’t look as nice that way and I couldn’t really get away with it for H’s school clothes. So ironing is part of my week and I am always looking out for ways to make it easier. Until recently I used to iron clothes and either fold them up into a basket or hang them on hangers. The hangers would then go on the door handle or the top of the door (depending on garment length), but that caused problems when H wanted to use the spare room to play on the Xbox and wanted to close the door. My newly ironed clothes would end up on the floor and often my efforts would be wasted. So I’ve enjoyed using the 6 Arm Iron Tidy from Addis to hang up my ironed clothes. You can hang things up and because I have it out of the way in a corner, it doesn’t get in anyone’s way, so I can move the clothes to where they belong when it suits me. The is a bit of a knack to getting the top tier to stay up, but I’ve got better at that and you can still use it even at half size anyway. I’ve also found it useful for drying clothes. It’s really easy to hook a swimming costume or a bra over the arms and I have found it easier to dry this sort of item that way. Ooh that airer folds down much smaller than my one. I’m forever tripping over mine. Thanks for the review!